The wine production area DOCG "Asolo Prosecco" is located on the hilly areas of the Montello and the Asolo Hills placed at the foot of the Dolomites. The hills are composed of medium deep soils , with a good minerai supply. This area is characterized by mild springs, warm summers and mild autumns due to the ideai position and the soil of the vineyards sites. The grapes are grown in our estates according to the guidelines provided by the certification Biodiversity Friend. Pale straw yellow and fine, persistent perlage. lntensely fruity aroma and in particular of ripe golden apple. The pleasant, elegant flowery aroma is reminiscent of acacia and wisteria flowers. Fresh, dry and flavoursome with a pleasantly fruity and harmonious finish. An excellent aperitif. lt can accompany fish marinateci with delicate aromatic herbs and herb-based first courses. DOCG Area "Asolo Prosecco" lies in the Veneto region, north of Venice, in the province of Treviso in the Montello and Colli Asolani hills at the foot of Dolomities. The grapes are grown in our estates according to the guidelines provided by the certification Biodiversity Friend. Intensely fruity with clear hints of ripe golden apple. Pleasant and elegant flowery sensation reminiscent of acacia flowers. Fresh, slightly sweetish and soft to the palate, flavoursome on the back of the tongue; an agreeably fruity and harmonious finish. Excellent as an aperitif. lt goes well with fish marinated with delicate aromatic herbs and herb-based first courses. Small hill area D.O.C.G. of about 106 hectares of vineyards between the villages of Santo Stefano and S. Pietro di Barbozza in the municipality of Valdobbiadene. A real cru that comes from a perfect combination of a sweet microclimate and a very old land with moraines, sandstones and clays. lntensely fruity aroma with clear hints of ripe golden appie. Pleasant and elegant flowery sensation reminiscent of acacia flowers. Area between the towns of Conegliano and Valdobbiadene. lt is a hilly area of morainic origin with calcareous soils mixed with loam and in some cases also calcareous-clayey soil. DOCG Area Conegliano and Valdobbiadene. lt is a hilly area of morainic origin with calcareous soils mixed with loam and in some cases also calcareous-clayey soil. Fresh and flavoursome on the back of the tongue; an agreeably fruity and harmonious finish. Pale straw yellow with shiny greenish reflections, subtle and delicate perlage. Intensely fruity aroma and in particular of ripe golden apple. The pleasant, elegant flowery aroma is reminiscent of acacia and wisteria flowers. Fresh, elegant and slender with a soft character with a pleasantly fruity finish. Is the Treviso aperitif par excellence; suitable for all hours of the day. Very well combined with appetizers of small shellfish of the lagoon and first courses made with wild herbs. Area D.O.C.G. between the towns of Conegliano and Valdobbiadene. It is intensely fruity with evident notes of golden apple. Pleasant is the floral note that recalls acacia flowers. It is the Treviso aperitif par excellence; suitable for all hours of the day. At the table it accompanies very well appetizers of small crustaceans of the lagoon and first courses made with wild herbs. Pale straw yellow with a fine, delicate perlage. Fruity and flowery aroma with fine aromatic and citrine hints. Fresh and lively in the mouth. Light-bodied and elegant with an agreeably aromatic and fruity persistence. 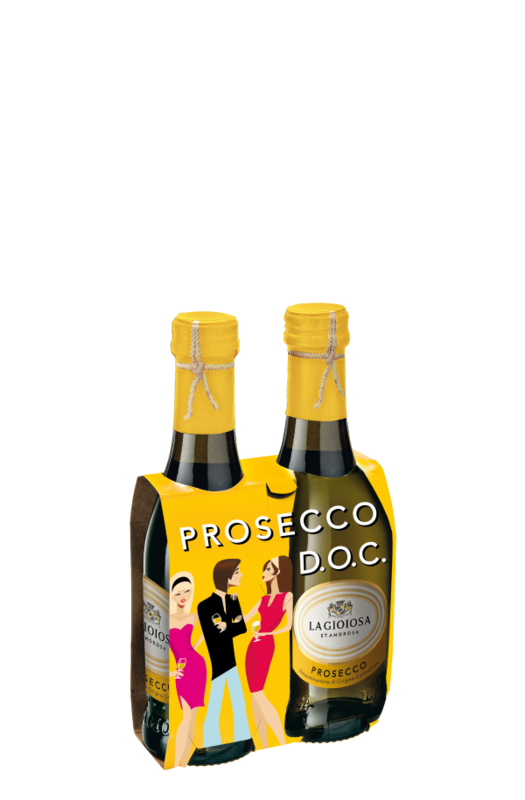 Pleasant as an aperitif, but suitable for drinking at any time of the day; it goes well with delicate shell-fish and seafood hors-d'oeuvre. Very pale straw yellow and a fine, persistent perlage. The aroma is fruity and flowery with hints of ripe golden appie and small mountain flowers. excellent aperitif to accompany savouries. Ideal with steamed shellfish. Tre Venezie with alluvial and porphyritic soil, fertile. Muller Thurgau (cross between Riesling Renano and Sylvaner obtained in 1882 by the Swiss Hermann Muller from Thurgau). pale straw yellow with greenish reflections, subtle and delicate perlage. aromatic fruity intense ripe fruit where the apple and pear predominate, with notes of lavender. soft to the palate to express all its liveliness. 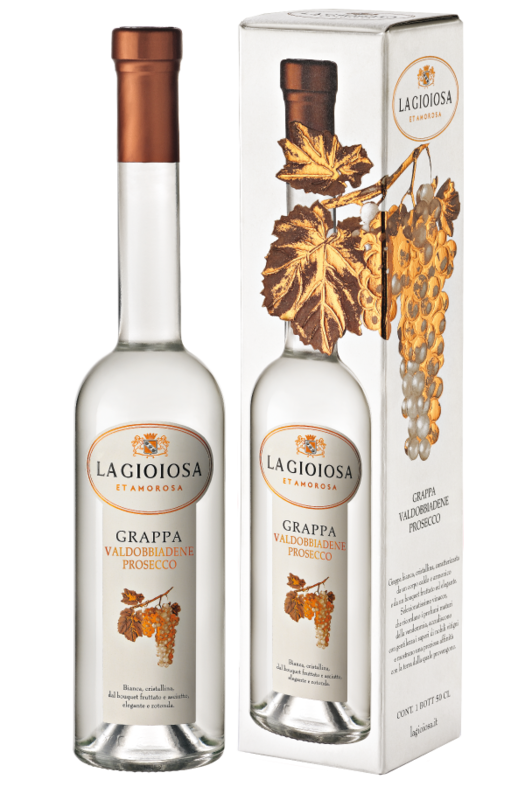 It has a slim and elegant body with a pleasant aromatic and fruity persistence. It is a wine suitable both as an aperitif and in combination with fish dishes with oven cooking. Very pale straw yellow with a fine, delicate perlage. Light-bodied and elegant with an agreeably aromatic and fruity persistence. Delimited geographical area includes the entire administrative territory of the provinces of Gorizia, Pordenone, Trieste and Udine in the Friuli Venezia Giulia Region. Straw yellow with excellent consistency. Fine, elegant, with aromatic notes, with fruity and mineral hints. Strong, velvety, full, pleasantly aromatic and of great harmony. First courses of Mediterranean cuisine, with baked fish and roasted white meats. Areas dedicated to vine-growing in the north-eastern regions of ltaly with marly soils of alluvial origin rich in subsoil. Cuvée composed of various white and red grapes varieties for the production of sparkling wines. Light and bright rose colour. Fine and delicate perlage. Fruity and flowery bouquet with delicate notes of unripe golden appie and small mountain flowers. The flavour is dry, fresh and zesty, with a fruity and harmonious aftertaste. Excellent as an aperitif. Ideai with fish especially with Livornese style fish. Areas dedicated to vine-growing with marly soils of alluvial origin rich in skeleton. Cuvée composed of various white grape vines suitable for the production of sparkling wines. Pale straw yellow with greenish reflections, minute and persistent perlage. A fruity and flowery aroma with delicate hints of unripe golden appie. Dry, fresh with artemisia notes. Ideal with raw shellfish and seafood, ham and melon. Excellent as an aperitif and at any time during the day. Areas dedicated to vine-growing in the north-eastern regions of ltaly with deep, medium-textured soils. Cuvée of the base wine composed of various red berry vines among which Merlot stands out. Intense ruby red and a fine, delicate perlage with persistent foam. Intensely fruity of strawberry grapes and wild strawberries. Sweet and zesty flavour. Medium-bodied with an agreeable aromatic lingering sensation. 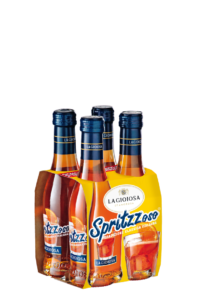 Suitable to be paired with fruit flans or with biscuits, cakes and pastries without cream; ideal for strawberries in red wine. Areas dedicated to vine-growing in the north-eastern regions of ltaly with deep and medium-textured soils. The base wine cuvée is made from various white grape varieties. Pale straw yellow, thin and delicate perlage. Fresh and lively with a pleasant and persistent aftertaste. Excellent as an aperitif and at any time during the day. Ideai with vegetable hors- d'oeuvre, with shellfish and delicate first courses. Pale straw yellow with a minute and persistent perlage. lt has a fruity and flowery aroma. Excellent as an aperitif and at any time during the day. Ideal with vegetable hors- d'oeuvre, with shellfish and delicate first courses. The cuvée is made from various white grape varieties. Very pale straw yellow and a fine, delicate perlage. Fresh and lively on the palate, it is medium-bodied with an agreeably aromatic persistence. Suitable as an aperitif, but also for drinking at any time of day; it can accompany vegetable-based hors-d'oeuvre and shellfish or delicate first courses. Areas dedicateci to vine-growing in the north-eastern regions of ltaly with deep, medium-textured soils. The base wine cuvée consists of various red and white grape varieties. Light rose colour, bright, it has a fine and delicate perlage. Fruity bouquet with raspberry and currant notes. The flavour is fresh and zesty, with a pleasant winy taste. Ideal for accompanying cold meat hors-d'oeuvre and white meat courses. Areas with a high wine-growing vocation in the north-eastern regions of Italy with deep and medium-textured soils. Cuvée composed of various white grape varieties. Pale straw yellow, fine and delicate perlage. 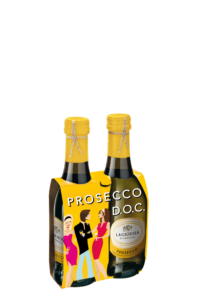 Suitable as an aperitif, but also for drinking at any time of the day; it can accompany vegetable-based hors-d'oeuvre and shellfish or delicate first courses. The base wine cuvée consists of various red grape varieties. Intense red ruby colour; it has a fine and delicate perlage together with a pleasant pale purple froth. Intensely fruity and floral of black cherry with violet notes. Strong fruity and flowery bouquet of marasca cherry and violet notes. Sweet on the palate, lively and zesty, it is medium-bodied with an aromatic persistence. Area of the Marca Trevigiana extending from the hills of morainic origin as far as the plain with soils of alluvial origin rich in subsoil. Pinot Bianco and Pinot Nero. lt has a delicately fruity aroma with hints of wild strawberry and blackcurrant as well as a pleasant flowery touch of dog-rose. lt is elegantly fresh yet smooth with a fruity, winy finish. Suited to delicate hors-d'oeuvre with cold cuts, pasta with vegetables, seafood salaci and omelettes with herbs. Very pale straw yellow with accentuateci greenish glints and a fine, persistent perlage. Delicate hint of unripe yellow fruit with gentle vegetable aromas. Light-bodied with a decidedly fresh and agreeably soft flavour and a delicately fruity aftertaste. Pleasant as an aperitif, also suited to accompany small raw shellfish and warm vegetable pielets. Area of the Marca Trevigiana with loose calcareous-clayey floodplain soils, rich in subsoil. Pale straw yellow with greenish glints and a fine, persistent perlage. lt has a fruity and flowery aroma with hints of unripe golden apple and tuberose flowers. A fresh, lively and fragrant flavour with a pleasantly fruity aftertaste. Excellent aperitif, ideal with vegetable and fish hors-d'oeuvre; it also goes well with fried shellfish or steamed fish. D.O.C. Venezia area in the provinces of Treviso and Venezia with mainly clayey floodplain soils, fresh and poor. The aroma is markedly fruity with a predominance of blackberry, but also small red berries. lt has an agreeable flowery hint of rose with a delicate pepper nuance. Dry and persistently flavoursome. Notable round tannins and a warm, pleasantly bitter aftertaste. Veal stew with wild mushrooms. Excellent on roasted red meats and semi-matured cow's cheeses. Area of the Marca Trevigiana with dry, loose floodplain soils rich in subsoil. The generous bouquet is reminiscent of wild violets and marasca cherries with an agreeable herbaceous touch. Perfect wine for serving with mixed grills and pork meat. D.O.C. Venezia area in the provinces of Treviso and Venezia with floodplain soils, mainly clayey and rich of subsoil. Hints of small berries, in particular raspberry with a floral note of violet and delicate pink pepper. Dry, flavoursome, with an agreeable touch of tannin. lts fruity flavour is persistent and the finish slightly herbaceous. Ideal with the classic beef, pork and lamb or mutton roasts and with ripe cheeses. Blend of different red grapes. Hints of small fruits ofthe forest, in particular raspberry, with a flowery sensation of violets and delicate pink pepper. lt is dry, flavoursome, with an agreeable touch of tannin. lts fruity flavour without herbaceous sensation. lt goes well with the classic beef, pork and lamb or mutton roasts and with ripe cheeses. DOC area in the north east of ltaly. Very bright pale straw yellow. Marked fruity and flowery nose reminiscent of the countryside in summer. dry, round and flavoursome taste, well-structured, with a fruity, warm and well-balanced finish. A perfect accompaniment for Mediterranean first courses with rock-fish and cherry tomatoes. Excellent with raw ham and melon or with fresh, creamy cheeses. Acquavite obtained from the distillation of pomace of Glera vine coming from the area of Valdobbiadene Prosecco Superiore DOCG and selected at the time of pressing. soft grappa characterized by a remarkable aroma, characterized by notes of ripe and tropical fruit, honey and white flowers. To fully appreciate the extraordinary aromatic quality of this type of product, we recommend tasting it on its own. Ideal also with Espresso coffee. 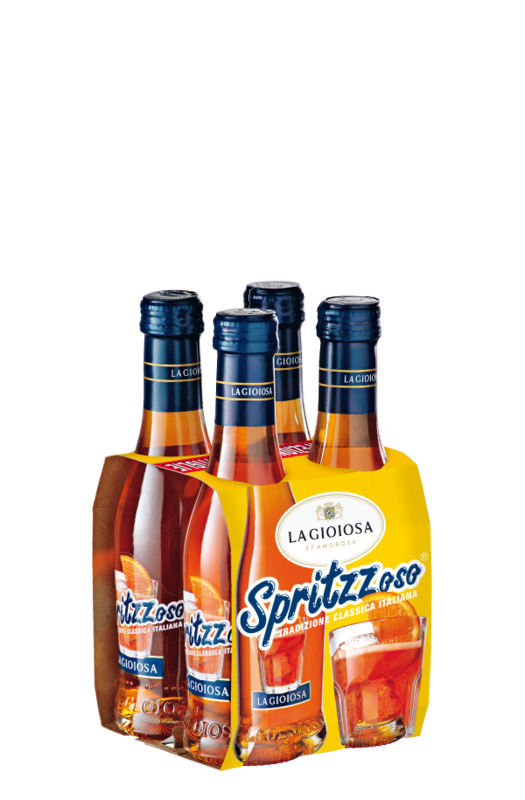 The Spritz is a typical Venetian aperitif. The base wine cuvée is made from various white-berry grape varieties. It has an attractive sunset orange color. Has a good balance between bitterness/sweetness and pleasant aromatic persistence. Ideal as an aperitif, but also for drinking at any time of the day. It can be paired with finger food and snacks. The base wine cuvée is made from various white-grape varieties. Attractive straw yellow colour with a good balance sour / sweetness, with an agreeably aromatic persistence of Edelflowers aromas. Suitable as an aperitif, but also for drinking at any time of the day; it can accompany finger foods and snacks.